Home » video » How to Download and Convert YouTube FLV to MP4 on Mac or PC? How to Directly Download YouTube in FLV, WebM and H.264 to MP4 or Convert the already Downloaded YouTube video to MP4? We have to admit that YouTube has become the world's most popular video-sharing website where you can freely discover, watch, upload and share videos. Though have successfully downloaded YouTube videos, the downloaded videos is in FLV format or WebM format which can not played on most media players. This article just aims to solve the above problems! The following will introduce a step by step guide on how to download YouTube video which is in FLV, WebM, and H.264 directly to MP4 format or convert the already downloaded FLV YouTube or WebM YouTube to MP4. 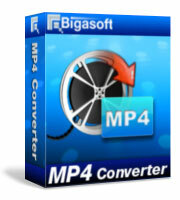 Free download Bigasoft MP4 Converter (Windows Version, Mac Version), install and run it. Bigasoft MP4 Converter, a powerful YouTube to MP4 Downloader and Converter, can easily download and convert YouTube video to MP4 including YouTube FLV to MP4, YouTube WebM to MP4, YouTube H.264 to MP4 and more. Besides downloading and converting YouTube video to MP4, it also can convert YouTube video to other video formats like AVI, WMV, MOV, MPG and more. Moreover, it even can download and convert YouTube video or audio to MP3, WAV, WMA, AAC, M4A and more. Click the small triangle to the right of "Add File" button, a drop down menu will pop up; and then click "Add YouTube Video..." from the drop down menu, a download dialog box will turn up, and then paste the YouTube URL to the dialog box, finally click "OK" button. Usually, the default output format is just the MP4 format. If not, click the drop-down button on the right side of the "Profile" to select MPEG-4 Movie (*.mp4) as output format. Click "Convert" button, this powerful MP4 Converter will fast download YouTube video to MP4 with high video quality.